Sysadmins working for SMBs are no stranger to GFI Software, so when I heard about a new product coming out to help with network management, I was eager to give it a try. 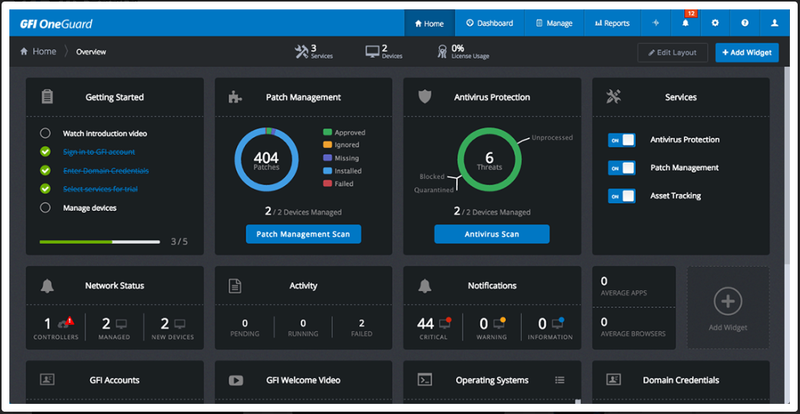 GFI OneGuard is the latest tool from GFI, offering antivirus, patch management, resource management, and reporting in a single, easy to use application. GFI OneGuard offers antivirus protection for your systems leveraging Kaspersky Lab antivirus. This endpoint protection can be centrally configured, you can run on-demand scans as well as set scheduled scans, and take actions based on any malware found. You can push install the software and agents to all your domain-joined machines to ensure 100% coverage, and report on them to confirm your status. GFI is no stranger to patch management, and GFI OneGuard brings their expertise in patch management to you. You can check the status and push updates for both Windows operating systems and third-party software installed on your systems, ensuring they are kept up to date and your network secured from vulnerabilities. It goes way beyond just turning on Automatic Updates. Think about that Excel spreadsheet you use to keep track of all your servers, workstations, and laptops. When was the last time you had the opportunity to fully update it? Do you even know what the make and model of every user’s laptop is? How many of which brand of server you have in the closet, and which are out of warranty? With Asset Tracking, GFI OneGuard lets you track not only hardware, but also installed software, so you never have to worry about being out of compliance. You will know what hardware you have, what is inside each machine, and what is installed on each machine. All the data in the world is useless if you cannot make sense out of it, share it, and report on it. GFI OneGuard includes robust reporting so you can provide summaries to your boss, and details to your team, making sure you all know exactly what you need. Whether you need to show value, or plan for next year’s budget, the reporting capabilities within GFI OneGuard has the details you will need. GFI OneGuard also has remote shutdown/reboot, system messaging so you can broadcast alerts to a user, a group, or your entire organization, simplified billing, and the option to use local or remote SQL, or even SQL run in the cloud. There are three components to GFI OneGuard. They work together to help manage and protect your network. The central web console is where you administer the application, decide what needs to be pushed to your systems, and where you can run reports. It’s your mission control, dashboard, and early warning system all wrapped up into one clean and easy to use console. It’s web based, so you can access it from your workstation, tablet, or mobile phone using any current web browser. A controller is what stands between the administration and the end devices, and can be run on the same computer as the web console or installed separately, depending upon your size and your needs. Finally, there is the agent software which is deployed to all the Windows systems in your environment. The agent provides information to the controller and deploys the settings or takes the actions the administrator wishes for the particular system. 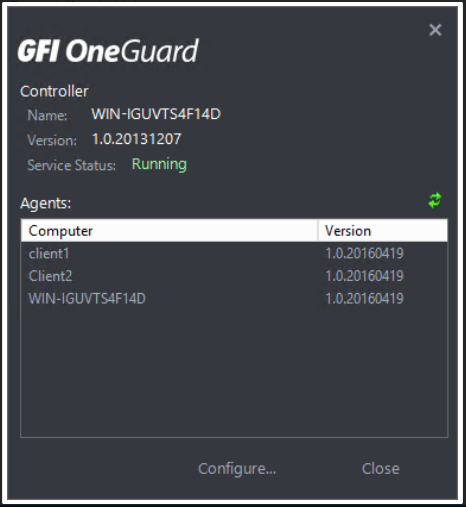 The GFI OneGuard system components, including both the web admin console and controllers, can be installed on any current 64-bit Windows O/S, including 2016 and even Windows 10. Of course, I recommend you stick with running on a server. That server needs at least 8GB of RAM, and can use either SQL Express, SQL 2008 R2 and later, and even Microsoft Azure SQL. If you have less than 500 devices, use SQL Express. If you have up to 10,000 devices, you will need to use either full SQL or Azure SQL. The server also needs to be running IIS, .NET Framework 4.5.1, ASP.NET 4.5.1, and be domain joined. Finally, it’s a server, so make sure you give it a static ip.addr. Sure, you could still run servers with DHCP, but GFI OneGuard requires a static ip.addr. In addition to the main GFI OneGuard server, you will want to install a controller per 1000 machines, or if you have multiple sites, one per site with no more than 1000 devices per. You can manage up to 10,000 devices using OneGuard, which means it’s not just for SMBs. Even some enterprises will be able to take advantage of this. Agents can be installed to any currently supported version of Windows operating system. 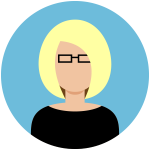 GFI has some pretty good online wizards to help walk you through planning and deployment, so you can get up and running quickly. 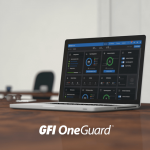 GFI OneGuard has a lot to offer the SMB or enterprise IT admin who is trying to ensure their systems are running fully up to date and protected, and to keep a handle on all things on their network. If you have enough servers that you cannot keep them straight in your mind, you’re probably who GFI OneGuard was built for. 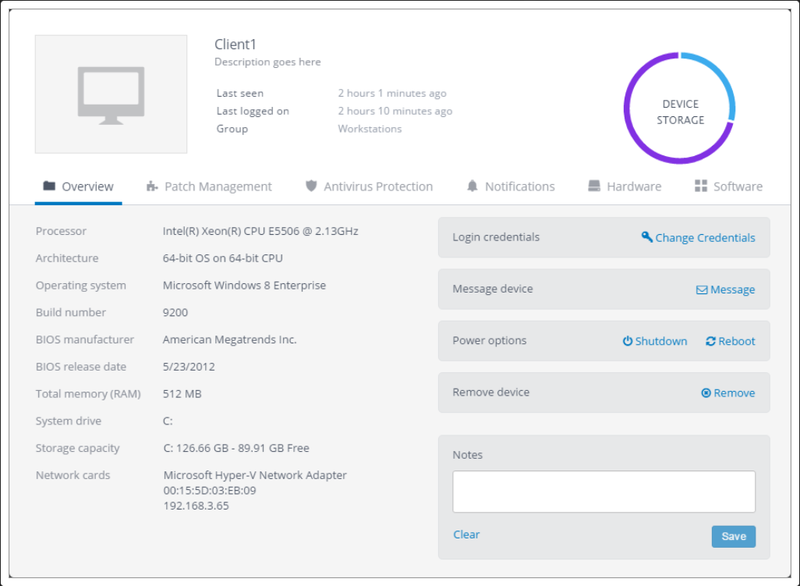 If you’re interested in trying GFI OneGuard, you can download a free trial from https://www.gfi.com/products-and-solutions/network-security-solutions/gfi-oneguard/try-now. Then check out the very helpful and detailed documentation at https://www.gfi.com/products-and-solutions/network-security-solutions/gfi-oneguard/resources/documentations, where you can find the Adminstrator Guide, a quick start guide, deployment help, and even an end-user guide! Why would you partner with an antivirus company that the US government has warned against? As a partner this is very frustrating!!! GFI Software acknowledges that the US Government has expressed concern. At this time, there is no confirmed breach of integrity on the part of Kaspersky. However GFI will continue to monitor the U.S. Government warnings on Kaspersky as well as feedback from our partners and customers to determine if any changes need to be made to our products.